Where is the pain really coming from? It can be very frustrating trying to figure out the cause of your back pain or knee pain or ankle pain when you are suffering from multiple different issues? So, you go see a foot doctor for your foot/ankle problem, then you see an orthopedic surgeon for your knee pain and then a back doctor for your low back issue. You often come away confused about which one of your problems is the root cause or if you have multiple causes. You get frustrated that all your doctors don’t seem to communicate or that nobody is actually helping YOU to solve YOUR pain puzzle. Seeking medical opinions is always a good start and seeing specialists is a good way to get answers, but often times you need to see a physical therapist that can help you put YOUR body puzzle together. Most of the patients that we see have or have had multiple issues. An old ankle surgery from 10 years ago may not necessarily still be directly bothering you, but since then, you have had a knee surgery and now are suffering from recurring bouts of low back pain. 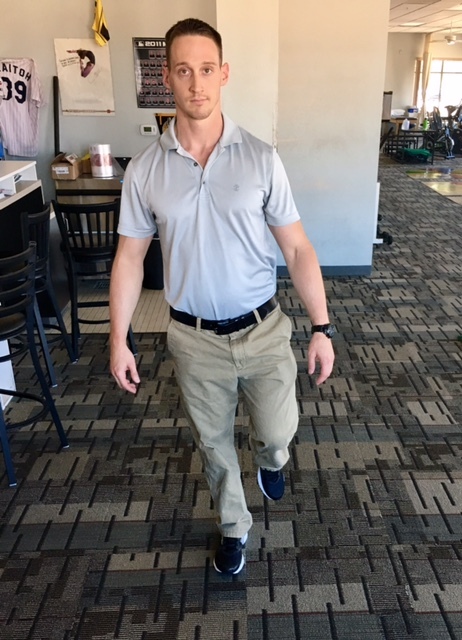 So, perhaps the ankle range of motion is limited and is partially causing compensations to occur that are limiting how your leg muscles are working and you have functional weakness on that leg. That then leads to excessive forces to your pelvis and low back. 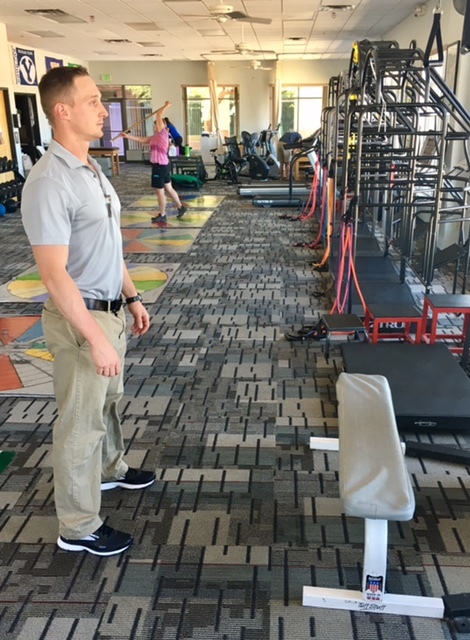 As physical therapists, we will develop individualized exercise prescriptions that are unique to your complete functional situation. 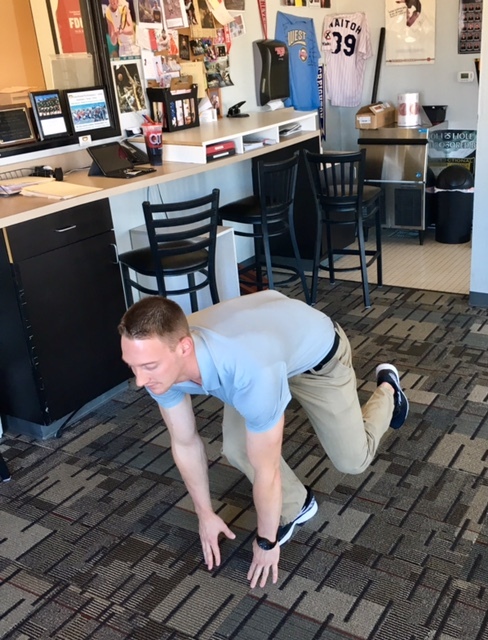 Since we have the experience of dealing with a variety of patients with multiple issues, we consistently identify common trends in joint immobility and muscle weakness. 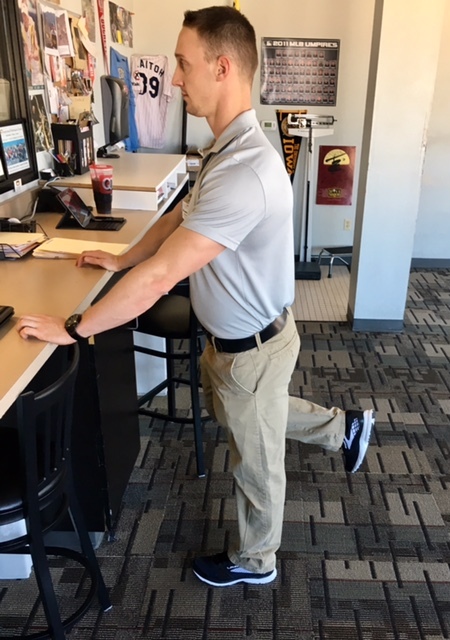 So, we have listed a few lower body stretching and strengthening exercises that can be helpful in getting you functioning again. Please note that it is best to actually have a therapist evaluate you prior to starting them and get clearance from your physician. All exercises should be pain-free. Give FPC a call to see if we can help solve your “pain puzzle”! 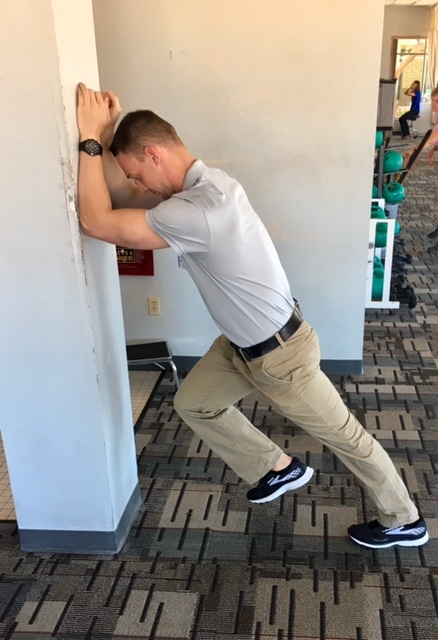 Begin with most of your weight on the back leg with your foot facing the wall, heel on the ground and hands on the wall. Step your front leg to the right (shifting your hips to the right), toe touching the ground. Step your front leg to the left (shifting your hips to the left). Repeat 10-15 times and switch legs. Begin standing in a wide stance with both feet facing the stable step that is approximately knee height (bathtubs work great). Then, keeping a wide base, put one foot on the tub/step, still facing that foot forward. 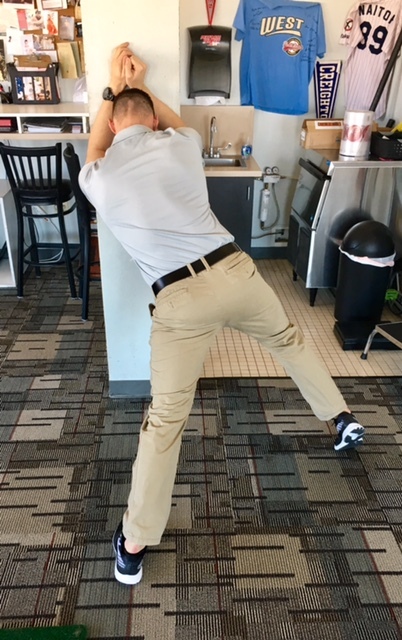 Put you hands on the front knee and drive that knee forward, keeping the back knee straight, until you feel tightness in the front of the hip on that grounded leg. Hold 1-2 seconds and return to the starting position. Repeat 10-15 times, then switch legs. Begin standing on one leg and resting your hands on a counter-top, or something stable. Bend into a shallow single-leg knee bend (pain-free). 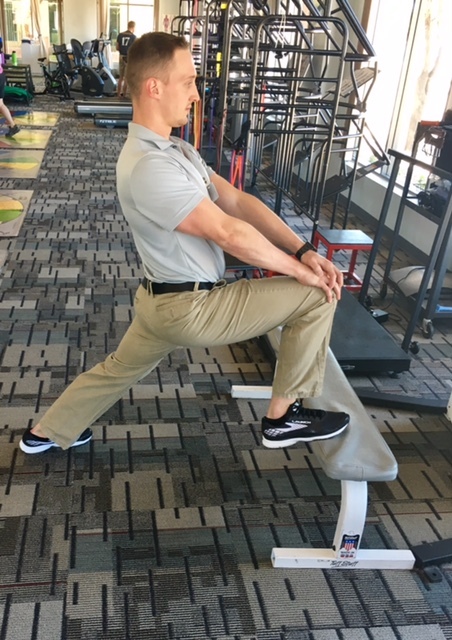 Repeat 10-20 times, adjusting the pressure with your hands on the counter, then switch to the other leg. 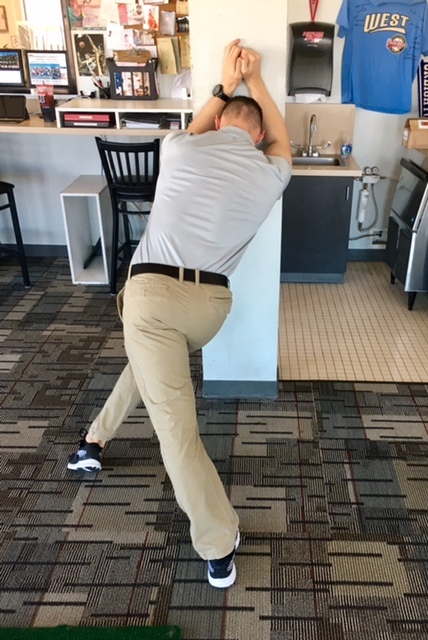 If you have advanced strength, move away from using your hands on the counter for support. 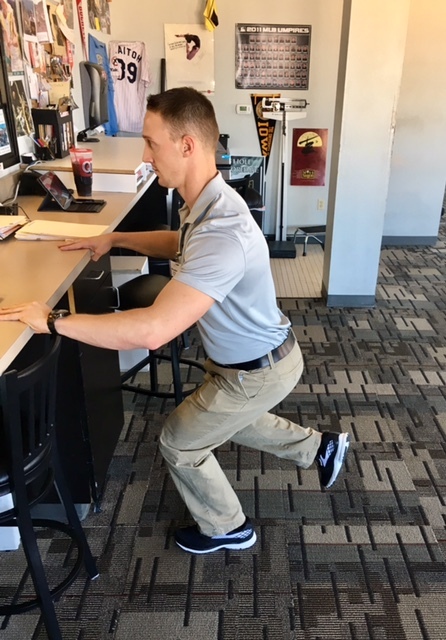 Perform the single leg squat into a deeper angle and progress to reaching your hands to the floor, and then potentially using hand weights. 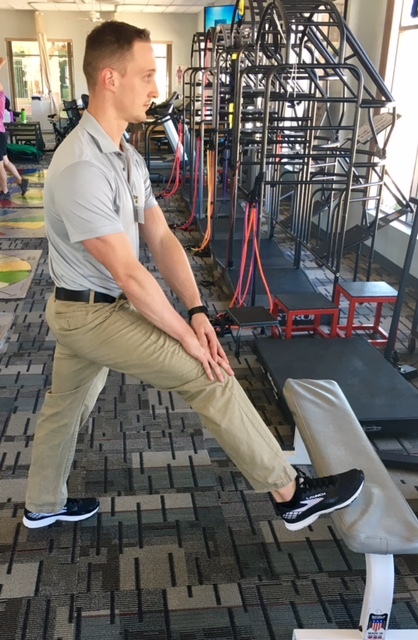 It’s OK to tap your opposite toe on the ground to help with your balance.